Loudonville, NY. Governor Andrew Cuomo has a 51-43 percent favorability rating among registered voters, up from a negative 45-49 percent favorability rating in November among likely 2018 voters. The Assembly has a 48-32 percent favorability rating – its best ever – up from negative 40-43 percent in June with likely voters, while the State Senate has a 49-38 percent favorability rating, just shy of its best ever, up from negative 41-45 percent in June with likely voters, according to a new Siena College poll of New York State registered voters. New Yorkers disapprove of the recent decision by the pay raise commission to increase the salary of legislators and restrict their outside income and limit stipends by a 57-35 percent margin. By an overwhelming 80-15 percent margin, voters say the Legislature should not approve the pay commission’s recommendation to increase salaries for state leaders. Infrastructure replaces taxes as the top issue voters want the governor to focus on this year. And there is strong to overwhelming support for many initiatives on Cuomo’s 2019 agenda. 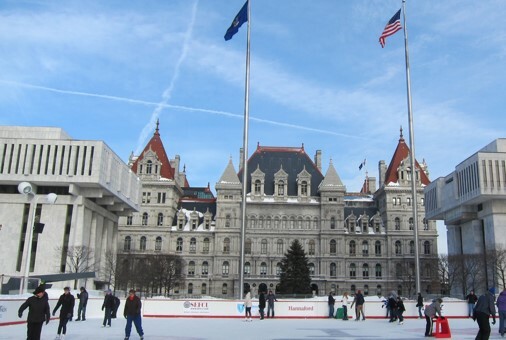 “While Cuomo has an eight-point net positive favorability rating, the Senate has an 11-point net positive favorability rating and the Assembly has its best favorability rating ever, net positive 16 points,” Greenberg said. “The Senate and the Assembly are each viewed favorably by a strong majority of Democrats and a plurality of independents. But a majority of Republicans views the Assembly unfavorably and an even bigger GOP majority views the Senate unfavorably. “Both legislative leaders are largely unknown to more than two-thirds of voters. Speaker Carl Heastie has a nearly break-even 14-15 percent favorability rating, while Senate Majority Leader Andrea Stewart-Cousins has a 20-12 percent favorability rating,” Greenberg said. This Siena College Poll was conducted January 6-10, 2019 by telephone calls conducted in English to 805 New York State registered voters. Respondent sampling was initiated by asking for the youngest male in the household. It has an overall margin of error of +/- 4.1 percentage points including the design effects resulting from weighting. Sampling was conducted via a stratified dual frame probability sample of landline and cell phone telephone numbers (both from ASDE Survey Sampler) from within New York State. Data was statistically adjusted by age, party by region, and gender to ensure representativeness. The Siena College Research Institute, directed by Donald Levy, Ph.D., conducts political, economic, social and cultural research primarily in NYS. SCRI, an independent, non-partisan research institute, subscribes to the American Association of Public Opinion Research Code of Professional Ethics and Practices. For more information, call Steve Greenberg at (518) 469-9858. For survey cross-tabs: www.Siena.edu/SCRI/SNY.